While the Kenosha Community Foundation does not operate a general scholarship fund, we administer a diverse and growing number of funds that offer scholarship opportunities to local students at all stages of higher education. All scholarship awards are made from specific funds with criteria established by their particular donor. We currently administer a wide variety of scholarship funds that have been established by individuals, families and organizations throughout Kenosha County. The scholarship award process is overseen by a committee of volunteers from Kenosha County. The Foundation’s scholarship cycle begins each year in January when we open the application process and continues through June when all scholarships are approved by our Board of Directors. Application deadlines vary for each fund. 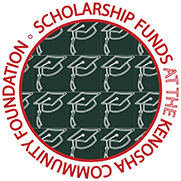 Over the past decade, the Kenosha Community Foundation has awarded more than $400,000 in scholarships to area students. To find out more about scholarship opportunities at the Foundation or to establish a new scholarship fund, contact us at email@kenoshafoundation.org.